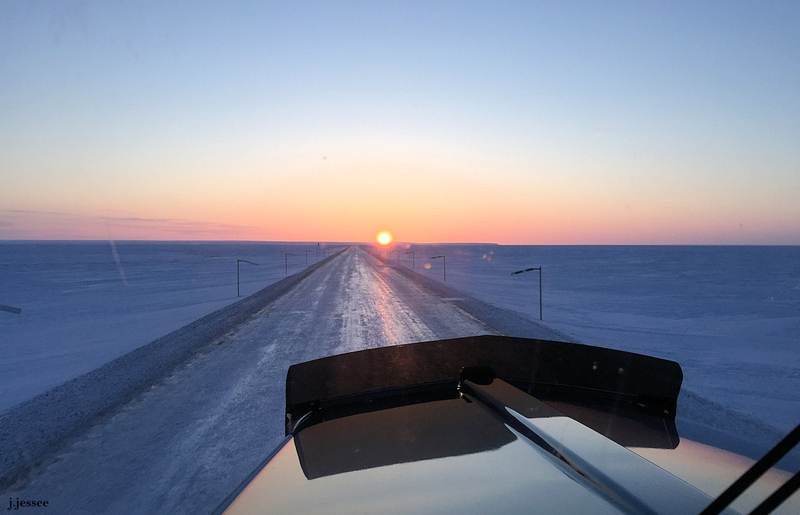 Call it sunrise or sunset, whatever you want, but the sun has officially shown up in Prudhoe Bay (the photo was taken the 21st of January). From November 24th to January 17th it doesn’t break the horizon but on the 18th it’s just above the horizon for about an hour. During those two months it’s not pitch black all day but instead it’s varying degrees of twilight for a couple of hours each day. On the 19th of January it’s up for an hour and a half, 30 minutes more than the day before, and each day more and more light is gained, though the gain slows down to about 12 minutes a day by the end of January. So people who live and work up there notice a drastic increase in light over this time. At the beginning of February the length of day is about 5 hours and by the end of February it’s about 9.5 hours! At March 21st the length of day is about 12.5 hours and by the 15th of May the sun never sets! This is all according to the website http://www.timeanddate.com (and corroborated by Jack 😉 ).